Cultural Path Shumokukan, the former residence of ceramics exporter Tamesaburo Imoto, is an oasis of calm situated in the corner of a busy urban city. It expresses the memories of the times it has seen since the Taisho era. Colorful layers of light fill the air of the Western-style building, while nostalgic aromas fill the air of the Japanese-style building. The garden shows the charms of the changing seasons. Cultural Path Shumokukan, the former residence of ceramics exporter Tamesaburo Imoto, reminds us of the time when it was built: its construction began at the end of the Taisho era and was completed at the beginning of the Showa era. Japanese- and Western-style buildings are preserved on a large block of land, plus two storehouses—one in the west and the other in the east—a tea room, and a garden. 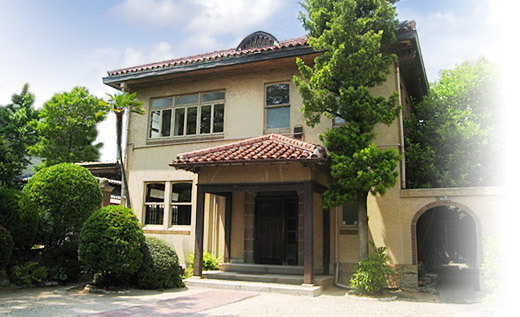 The residence was designated as a tangible cultural asset of the City of Nagoya in 1996, and a building of scenic importance in March 2008. Copyright (c) 2016 SHUMOKUKAN, City of Nagoya. All rights reserved.